It's 08:05 in San Diego, USA right now. San Diego Zoo Polar Bear Plunge Exhibit Live video from the San Diego Zoo Polar Bear exhibit. 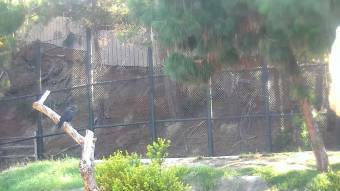 San Diego, California: San Diego Zoo Ape Exhibit Cam, 0 miles away. San Diego, California: Downtown San Diego, 0 miles away. San Diego, California: NB 5 JNO Laurel, 0 miles away. San Diego, California: SB 163 JSO Rte 8, 0 miles away. San Diego, California: SB 15 and SB 805 (Intersection), 0 miles away. San Diego, California: SB 15 at Miramar Rd, 0 miles away. San Diego, California: SB 5 at Dairy Mart Rd., 0 miles away. San Diego, California: San Diego Bay, 0 miles away.